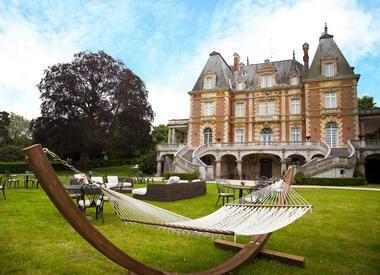 From a beachfront villa in Fiji to a romantic chateau in France, couples have more choices than ever when choosing their dream honeymoon destination. This is the time to take off from work, visit a new destination and check into a place that you'll never forget. Many of the villas that made our list are right next to some of the best snorkeling and scuba diving in the world. Since you will be just steps from the ocean, you can explore the fascinating marine life that each honeymoon destination offers. Likuliku resort in Fiji is one of the favorite Fijian resorts for honeymooners, giving them a choice of stunning overwater honeymoon suites and beachfront villas. Check into a Deluxe Beachfront Bure with a Plunge Pool and you will be right next to a beautiful sandy Fijian beach. The outdoor terrace has a private plunge pool and a romantic day bed with a privacy fence provided by lush tropical plants. The wooden deck extends from the bure living room and bedroom to offer the best in indoor/outdoor living. Leave the doors open and enjoy warm ocean breezes and listen to the sounds of the ocean. After dinner, order a cocktail and watch the incredible starry night right from the private pool. If you are looking for honeymoon suites with a private pool, this is a beautiful place to visit. Located on the sunny Kohala Coast of the Big Island of Hawaii, the newly renovated Bungalows at the Mauna Lani Bay Hotel offer honeymooners luxury and privacy in a stunning setting. 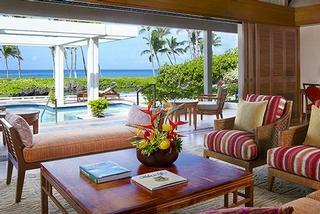 Each bungalow has a private pool with a view of fish ponds, the golf course and the ocean. Enjoy colorful Hawaiian sunset right from your Bungalow terrace. 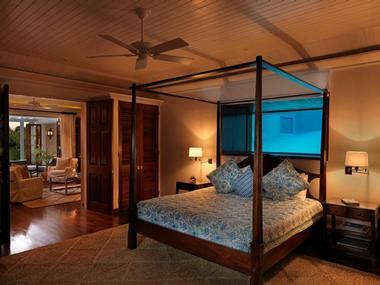 Each bungalow has two master bedroom suites with romantic four post beds featuring hand-carved headboards displaying the flower that the particular Bungalow is named after: Orchid, Bird of Paradise, Hibiscus, Plumeria and Heliconia. Two master bathrooms feature a private tropical garden with a rain shower and stand-alone tub. Each Bungalow has a full kitchen, a 65-inch TV, Koa wood floors and an iMac. Rates start from $4,000 per night. Browse more Hawaii honeymoon ideas. Las Ventanas al Paraiso offers couples a choice of three different villa layouts: One-bedroom Oceanview, One-bedroom Oceanfront and the Three-Bedroom Presidential Villa. 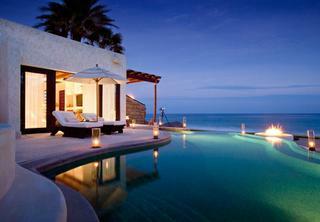 The luxury Oceanview villas overlook the Sea of Cortez in Mexico and have private infinity-edge swimming pools. Romantic touches include a patio with a large Jacuzzi, a fireplace and a telescope to watch whales and dolphins playing in the ocean. Oceanfront villas are located just steps from the beach. They offer similar amenities as the Oceanview villas. If you are looking for the ultimate in luxury on your Mexico Honeymoon, book the Three-Bedroom Presidential Villa, a two-story building with a private infinity-edge pool and Jacuzzi on the patio, an outdoor shower with a private garden and a full kitchen with service entrance and dining area. The villa measures 3,600 square feet in size. The Island of Koh Lanta, Thailand is home to white sandy beaches and luxury vacation resorts. Pimalai Resort offers luxury pool villas with modern Thai decor and vanishing edge pools overlooking the ocean. Set on a hill above the resort, the pool villas offer spacious living rooms and one-, two- or three-bedroom configurations. White fish sculptures have spouts with water cascading into the blue pool. A cozy day bed is set in the shade behind the pool so that you can enjoy unobstructed views of the ocean. The dining area is also covered and faces the view. If you open the curtains in the master bedroom, more ocean views will greet you in the morning. Rates start from $950 per night. You may decide to never leave your villa on your luxury honeymoon, but if you do, there is a beautiful sandy beach and many ocean activities to try on the island. Koh Lanta is one of the top diving destinations in the world, rich with marine life. Also a must-try is the luxurious resort spa. You can also book massages in the privacy of your own villa. The luxury pool villas at Laguna Resort in Bali are huge, giving vacationers from 3,875 to 8,073 square feet of living space. 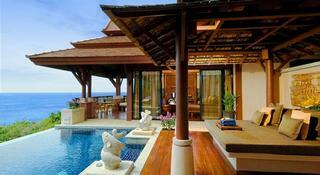 Each villa has a private pool and a secret garden with a gazebo furnished with a plush day bed. Fragrant tropical plants fill the air with a sweet aroma, wanting you to spend your days relaxing by the pool and in the gazebo. The adjacent outdoor treatment room with a massage table makes it easy to get massages without leaving the privacy of your luxury honeymoon villa. 24-hour in-room dining with Personal Butler Service and a fully equipped kitchen make sure that all your needs are taken care of. The butler station has a separate service entrance. The villa living room has a glass door and floor-to-ceiling windows that let in plenty of natural light. Furnished with characteristic Balinese decor and plush couches, the living room has a 42-inch LED TV, Bose audio system with an iPod docking station. Pool Villas cost $800 per night. Royal Davui is one of the best private island resorts in the world. The Royal Davui Pool Suite is the most luxurious on the island, offering awesome views from every room in the villa, whether you are soaking in the bath or lounging by the pool. 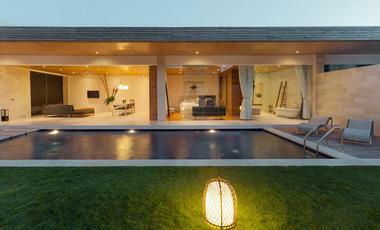 The luxury villa has a hidden indoor garden, private sun deck and a heated private plunge pool. There is a separate Jacuzzi spa bath with Fijian amenities. Have a romantic bath in the morning after breakfast, then head out to explore the island's secluded beaches. Snorkel in the pristine blue ocean, get treatments at the spa and go on a romantic sail on your honeymoon. 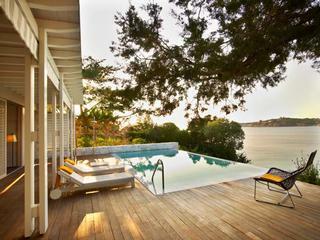 The newly renovated Bungalow Suites at Arion Resort in Greece features stylish modern decor and scenic ocean views. They are decorated with traditional whitewashed walls and artistic black-and-white photographs showing images of Greece. The bath tub in the bathroom overlooks the Saronic Gulf, allowing you to relax with a view. The outdoor deck extends out from the living room with plush lounge chairs and a private infinity pool. One- and two-bedroom layouts are available. Arion is a Starwood Luxury Collection Resort, so you can use your points to pay for your honeymoon suite. The Beach Villas at Constance Moofushi Maldives are one of two villas in this collection of best luxury honeymoon villas without a private pool. But we had to include them because of their rustic elegance, perfect for couples who find that less is more. 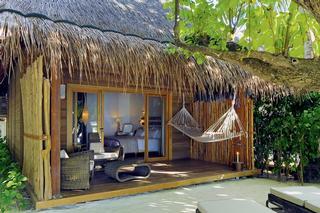 The Beach Villas are made of wood with high thatched palm ceilings. 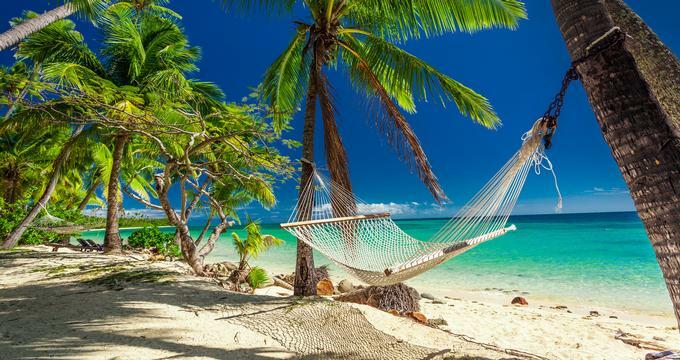 A hammock hangs on the shady terrace right over the beach. Plush lounge chairs steps from the bed beckon you to relax day and night. Although the villa is air-conditioned, you most likely won't need it because it's well ventilated due to its natural construction. Each villa has a spacious seating areas and a beautiful contemporary bathroom with black stone sinks. 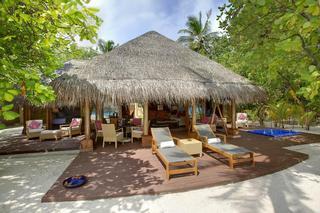 We recently wrote about Kanuhura in the Maldives because if won the "World's Best Luxury Private Island Resort" award. When you stay at this beautiful resort you can be sure that all of your wishes will be attended to. 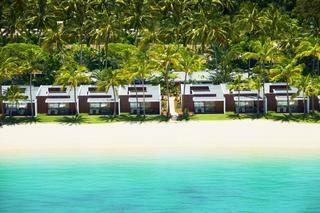 Grand Beach Villas at Kanuhura are spread out along the sandy shore. Each villa has its own private beachfront, giving honeymooners plenty of space and privacy. That's why the resort designers felt that you don't need a private pool, because the ocean is the perfect playground. 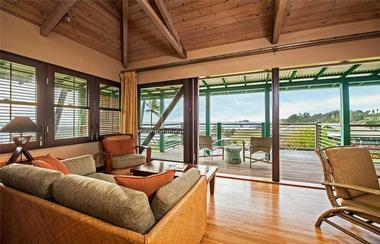 Floor-to-ceiling sliding glass doors open to reveal stunning views of the beach and the ocean. A romantic bathroom with a designer bath tub is perfect for relaxing after a day out in the sun. Click here for 12 Ultimate Luxury Vacations. 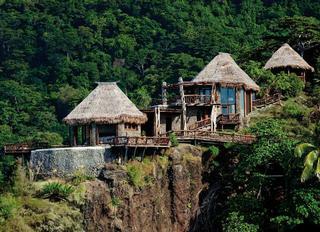 Laucala Island Resort is Fiji is a dream island getaway for honeymooners. The island is home to just 25 luxury residences. Check into the Peninsula Residence which is the most private and secluded on the island. It's a small "island on an island" because it is situated on its own private peninsula. Everywhere you look, you will be surrounded by clear blue of the ocean and the sky. The spacious living areas are connected to each other by rope bridges offering spectacular views. There is no lack of amenities either - you will have your own natural pool carved into the rock, a concealed private beach and your own jetty. If you are looking for a private beach honeymoon, this is a dream vacation spot. 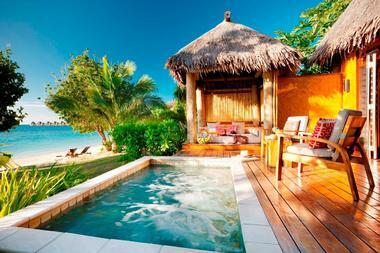 The only downside is that you will never want to leave this Fijian paradise for honeymooners. Rates from $7,000+ per night. We recently features Jimbaran Puri in our collection of 10 Spas with Best Water Views highlighting how couples can get a massage with open ocean views. 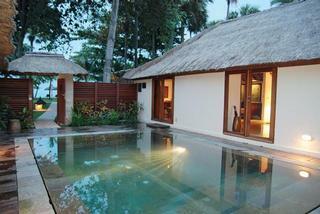 Jimbaran Puri's Deluxe Pool Villas are ideal for honeymooners. They have a sunken outdoor pool surrounded by candles at night, which is ultra romantic. The living rooms opens out to the pool and a private tropical garden. The bathroom has a deep soaking tub from black stone. Ask for a rose petal bath on your luxury honeymoon - the red of the roses contrasts beautifully with the black stone. 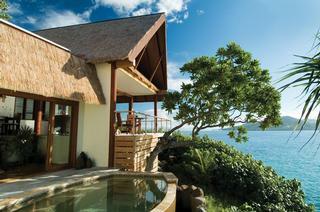 The luxury island honeymoon villas are among the best in Bali. Enjoy the cool marble floors, teak furnishings, Balinese art and high-tech entertainment system. One- and two-bedroom villa layouts are available. Honeymooners receive a Welcome drink and gift, Daily fresh fruits and bottled water, Afternoon tea served in your villa, Fully-stocked minibar, Laundry service and Wireless internet. Pool villa rates start at $490 per night. Designed by the renowned Amanresorts architect, Kerry Hill, Beach Villas on Hayman Island in Australia offer modern interiors and stunning views of the ocean, perfectly framed by their clever layouts. You will be just steps from a white sandy beach where you can go snorkeling, swimming and kayaking. There are just 8 luxury Beach Villas on Hayman Island. They all come with Beach Butler service, a private pool in an open air gallery with a day bed, a private terrace, an outdoor shower, a stunning bathroom with an island bath and a separate shower. The team of Beach Butlers takes care of every need while you are on the island. Let them know your preferences before your arrival and your honeymoon villa will be waiting for you stocked with your favorite items. These villas are not rented to children under 13, which makes them a great choice for a luxury honeymoon. Order room service and a massage and relax with views of the Coral Sea and Whitsundays. Sea Ranch Cottages at Travaasa Hana have some of the most beautiful views of the rugged coast of East Maui, Hawaii. The cottages are very cozy and room service is excellent, so like us, you may never want to leave. 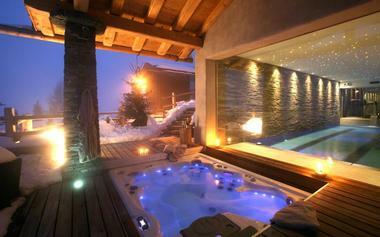 Ask for a cottage with a private hot tub when booking your honeymoon. Inside you will find organic linens and blankets, made in Maui bath products, delicious banana bread and other treats. With over 2,000 square feet of living space, Grand Pineapple Villa Suites at Round Hill Hotel & Villas in Jamaica are an excellent choice for honeymooners looking for affordable luxury and style. 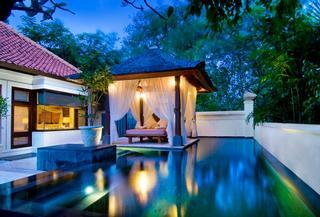 The villas have semi-private pools surrounded by lush tropical plants. You can have breakfast served in the villa suite each morning on your honeymoon. Enjoy personal housekeeping services in the villa and access to the extensive resort facilities at Round Hill. 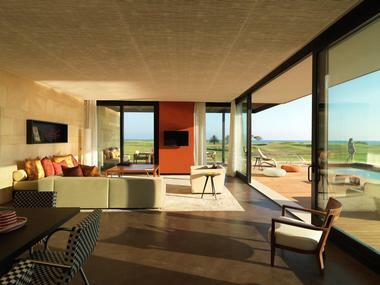 The 1,880-square-foot Presidential Suite at Verdura Golf & Spa Resort in Sicily, Italy has three scenic private terraces, a private outdoor swimming pool and a Jacuzzi. Have a romantic candlelight dinner outdoors while enjoying the view. The romantic suite is designed in contemporary Sicilian style with warm tones. Honeymooners can take advantage of the private dining menu and the unique private internal courtyard.